There's a lot of ways various people and places in Hollywood may choose to celebrate the upcoming April 3 birthday of the late, and legendary, actor Marlon Brando. A film festival comes to mind, as would perhaps a small ceremony at his star on the Walk of Fame. 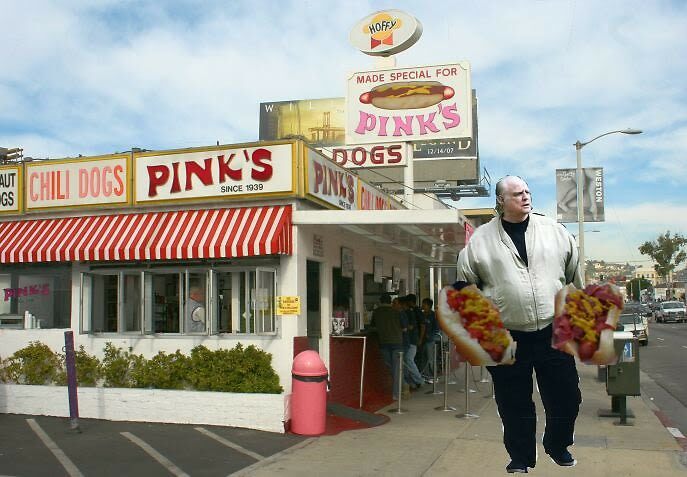 But this is not what tourist trap Hollywood landmark Pink's is doing. No, they're choosing to focus on the latter, weightier segment of the multiple Oscar winner's career by naming a chili cheese dog after him and giving away free hot dogs to those who show up today in costume. To quote his character Fletcher Christian from Mutiny On The Bounty: "you remarkable pig." Now, then, the details. The special hot dog will be called "The Brando," and it's a 10", ¼-lb all-beef weiner slathered in Pink's famous chili, mustard and onions. In other words, it's probably about one fifth of what latter-years Brando would have considered "a full meal," but we're sure it's plenty hearty for those of us not in the Orson Welles club. And to get it for free? Well, as reported by The Melrose Blog, you just have to show up at Pink's today dressed in costume. They recommend that you e-mail dsyatt@ssapr.com ahead of time because "supplies are limited," but let's be honest, the line's going to be around the block and you're not going to get one for free anyway. But that's no reason not to show up in costume, or really to copy Brando's timeless style whenever possible. Here, then, in no particular order, are our favorite Brando looks and how you can imitate them.